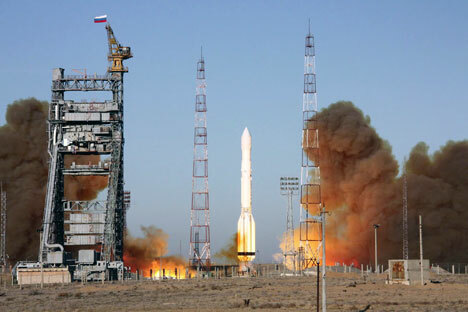 Three GLONASS-M satellites launched earlier this week failed to reach orbit. The satellites were to complete Russia’s Global Navigation System (GLONASS), which is meant to rival the U.S. Global Positioning System (GPS). According to unconfirmed reports, the Proton-M carrier’s malfunction is thought to have resulted in all three satellites falling into the Pacific Ocean near the Hawaiian Islands. Russia’s Federal Space Agency (Roscosmos) said in very laconic statement that the satellites failed to reach the correct orbit. A government commission was set up to investigate the failure. The satellites were the final three needed to make Russia’s GLONASS fully operational. State and military officials were all waiting for the launch and had already added it to the list of this year’s important space achievements. In his address to the Federal Assembly last week, President Dmitry Medvedev announced that the system would soon be completed. According to information posted on Roscosmos’ website, the Proton-M carrier took off from the Baikonur Cosmodrome at 1:25 pm, Moscow time. Ten minutes after take-off (after all three of the rocket’s launch stages were finished), the orbital block, consisting of the DM-3 booster rocket and three satellites, separated from the upper stage of the main launch rocket. Yet, even before the separation, the Proton-M veered off course by eight degrees. Having strayed off its planned trajectory, the booster rocket immediately disappeared from radar, according to a source in the space industry. Unconfirmed reports had the booster rocket and the three satellites plunged into a non-navigable area of the Pacific Ocean, 1,500 kilometers away from Honolulu, Hawaii. “Presumably, the third stage of the main launch rocket malfunctioned, causing the orbital block to separate much higher than was planned. This was not due to a programming error in the booster rocket, as some experts have assumed earlier,” said the space industry source. Yet, the source added, with no information about the flight’s malfunction, it is very difficult to establish the true reason for the accident. Russia has been trying to create its own global navigation system since the 1970s, when it started a project at the request of the Soviet Defense Ministry. The Krasnoyarsk-based Scientific Production Association for Applied Mechanics at the Soviet Ministry for Mechanical Engineering (now called M. F. Reshetnev Information Satellite Systems) was the project’s lead developer. The system, like its American rival NAVSTAR, was initially designed to provide accurate geographic locations of targets, especially military ones, for the navigation and guidance of high-precision weapons. The system operates by determining accurate distances between the system user and several satellites. The idea to make commercial use of the project only came later, after the Americans came up with a successful GPS based on their NAVSTAR system. The Soviet system planned to deploy more than two dozen satellites at some 19,000 km above the Earth’s surface. The first GLONASS satellite was launched in the Brezhnev era, on Oct. 12, 1982, but it was only on Sept. 24, 1993 that the system was formally put into service for the Russian armed forces. By that time, the orbital group consisted of 12 satellites. By December 1995, it had deployed all of the planned 24 satellites. However, more satellites were breaking down and going out of service than those being launched into orbit, and in 2001 the number of operational satellites shrank to eight. In the same year, the Russian government approved the Global Navigation System federal target program in order to support the system financially. Initially, the program’s budget of 23.6 billion rubles earmarked from the federal budget was to last until 2011, but in 2007, the program’s expenditures were increased substantially. In the end, the costs for the GLONASS program from 2002-2011 reached 140.1 billion rubles ($4.7 billion). GLONASS thus became Roscosmos’ largest project, with one third of its total 2010 budget of 84.5 billion rubles going to the GLONASS program. These measures did help invigorate GLONASS, although not as fast as some would have liked. In 2003, the first updated GLONASS-M satellites were launched. They boasted a higher precision system and the ability to send signals using civilian frequencies. Currently, there are 26 satellites in orbit, of which 20 are in working condition, two are on standby, and four are under maintenance. For comparison, the American GPS system has 31 satellites. There were plans to launch third-generation GLONASS-K satellites starting in December 2011, with even higher precision systems and a service life of 10 years. Moreover, at President Medvedev’s request, the government was preparing in the coming year to adopt a new federal target program for the development of GLONASS from 2012 to 2020. Yesterday’s launch of the Proton-М was the 11th launch of the carrier rocket this year. The 10 previous ones went off smoothly, including two launches that carried six GLONASS systems into orbit. The cost of a GLONASS satellite has never been disclosed formally. “American satellites deployed in the GPS system are estimated at $70 million, while Russian satellites are about 25 percent cheaper. Therefore, taking into account the cost of the launch rocket and booster, some 5 billion rubles ($160 million) have been lost,” according to a source in the defense industry. This week's malfunction puts off the completion of Russia’s global navigation system indefinitely, cancelling the celebrations scheduled for this year. According to Igor Lisov, editor of the space journal Novosti Kosmonavtiki (Space News), GLONASS satellites are produced routinely—while some are being launched into orbit, others are being prepared for launch, and still others are being assembled. The next launch could take place in 6-7 months. The first failure of a Proton-K took place on May 27, 1993. Due to the malfunction of the second stage of the launch rocket, Russia’s Gorizont-39 telecommunications satellite failed to reach orbit. On Nov. 16, 1996, the Mars-96 interplanetary station, worth $300 million, was launched into orbit by a Proton-K with a D-2 booster. The station, however, soon fell out of orbit and into the Pacific Ocean after the booster rocket malfunctioned. On July 5, 1999, Russia’s Raduga-1 military communications satellite crashed due to a poorly-welded seam on the cover of the turbine pump of one of the four engines of the second stage of the Proton-K rocket. The debris landed in the courtyard of a private home in the Karaganda region of Kazakhstan, straining relations between Moscow and Astana. Kazakhstan banned all Proton launches for two months until it was paid $271,000 in environmental and property damages. On Oct. 27, 1999, Express-А1 communications satellite launched by a Proton-K crashed in the Karaganda region, again, following the failure of the rocket’s first cruise engine. Astana received $407,000 in compensation. On Feb. 28, 2006, a Proton-M rocket failed to launch the Arab communications satellite ArabSat-4A into orbit due to the failure of the Briz-М booster. On Sept. 6, 2007, a Proton-M rocket and Japan’s telecommunications satellite JCSat-11 crashed 40 km away from the Kazakh city of Zhezkazgan, contaminating its suburbs with highly toxic fuel. It happened that Kazakh President Nursultan Nazarbayev was visiting the city when the accident happened. This time, Kazakhstan asked for $60.7 million in damages. The disaster was caused by the failure of the control power units of the launch rocket’s second stage. On Mar. 25, 2008, a Proton-M failed to launch the American communications satellite AMC-14 into orbit after the engine of the Briz-M booster failed.